A BRAVE Zimbabwean tour guide is presumed dead after plunging 90m into the Victoria Falls while trying to rescue a tourist, police said. The unnamed man was working for South African tour company, Sunway Safaris, reports said on Sunday. 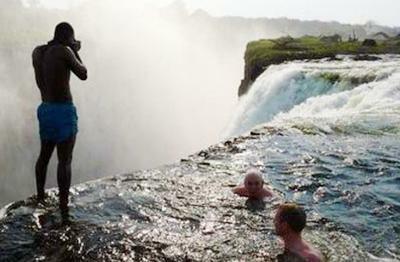 The man was accompanying several western tourists on the Zambian side of the world's largest waterfall. Here, tourists swim dangerously close to the tipping point of the falls, only prevented from falling by a slippery, submerged lip of rock. Only the brave attempt a swim in the aptly named Devil's Pool - and tour guides are tasked with ensuring their safety. It was in fulfilling this duty that the tragic tour guide dived into the water to rescue a stranded tourists last Wednesday. A witness told the Sunday Mail: "The tour guide quickly grabbed the tourist’s hand and successfully pulled him back into the pool but in the process, he slipped and fell into the gorge down below." Horrified tourists on either side of the falls witnessed the incident.Chief Inspector Chisoni, in charge of the Victoria Falls Police Station (Zambia), said the tour guide is believed to have driven the tourists from South Africa. Livingstone Island tours run by Tongabezi Safaris operate the official Devil's Pool trip where clients are taken by boat to Livingstone Island from the Zambian side of the river. Here, water levels allowing, tourists are able to safely swim in the Devil's Pool, under the close supervision of trained guides. The trip is hugely popular, and no-one has ever been swept over the Falls on these tours - in fact no-one is known to have ever died at the Devil's Pool. Before Tongabezi launched their Livingstone Island tours many tourists would undertake 'unofficial' (and illegal) trips along the crest-line of the Falls, which at low water are bare for much of the length and gives access to the various dive and swim pools along the lip. In 2009 a guide sadly died saving a tourist - however this accident did not happen at the Devil's Pool as is often claimed in online news reports. 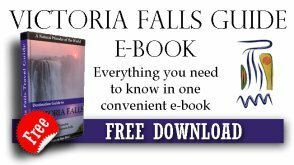 The client slipped while leaping across a small water channel on the edge of the Falls and the guide saved him, and unfortunately in the process slipped into the water and was swept over the edge. Which is why official tours are operated to professional standards with rigerous safety procedures. Watch a great video (without downloading malware or seeing anyone die) of an official Devil's Pool tour here - and you'll realise why it is so popular! For more information on this activity, visit this page on The Devils Swim. I lost a dear family friend in August 2011 atop the great falls, in the Angel's Armchair (a similar spot to the Devil's Pool. We had a local guide who offered to take us to the secluded pool at the edsge of the falls. It was a fateful trek across the edge of the Zambezi. Three of us went hand in hand and only two of us returned. Our Zemba dived into the pool from a cliff above the pool, copyin gthe guide who showed us what we could do if we so wished. I chose not to. I filmed Zemba as he elected to live in the moment... Heartbreaking. Who on Earth would go to swim at devils pool. He is very brave guide. So devastatingly sad. Ending his life to save another's. Now that is a real hero. This did NOT happen at the Devil's Pool. It ahppend elsewhere on the Falls while the group was hiking along. The tourist slipped and fell, causing the incident. it hapens when illegal guides accompany people walking onthe edge of the falls during the dry months October /november. one tourist slipped and lost his life/ guide must have ran away as nowhere to be seen? this is the story of some people irresponsible same as those saying stories they have no idea and damage our zambia. This is really depressing that guide is really a hero that he save that tourist. 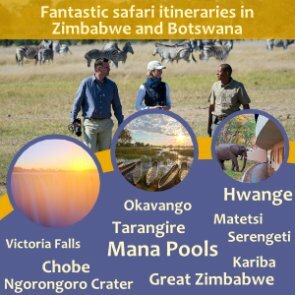 i am going to zimbabwe in a couple of months and going to victoria falls devils pool and im hoping that doesnt happen to me! As stated in previous posts this incident did not happen on the Livingstone Island tour/Devils swim operated by Tongabezi. These people hired a local guide who walked them along the face of the Falls. We strong advise not to do this. If you go with Tongabezi they are a very professional outfit with high safety standards. Just did the pool a few hours ago.it was exhilarating. A world class view. The guides very excellent and told me how to do every step of the way-thanks guys. Sacrificing your life for another is the highest manifestation of love. Jesus did this for us. What was the tourist thinking?? Hate to say it, but they would have been on their own. Why would even go that close to the edge??!! What since does that make??!! I like to live life a little on the edge but this brings a whole new meaning to the phrase!! Of the guides and their families!! Life in Africa is hard enough as it is :-(. That tour guide was a definite hero with a great heart, doing the best at his job. The western tourist however, they should not have put themselves and the tour guide in danger for the tour guide to have sacrificed his life to save the tourists. This tour guide is an amazing person to put himself in danger to save a strangers life, but he shouldn't have had to be in that situation, and that tourist should've actually thought a little about what they were doing. this is SERIOUSLY DEPPRESSING!!!!! btw I'm only 11, but have already decided i am definatly NOT going to attempt it. like, ever!!! My family and I visited Devi's Pool 8/16. It's certainly not for everyone but if you're an adrenaline junky it doesn't get much better than this. We did our research and felt it was a safe, though terrifying experience... Cherished moments we will never, ever forget. Now that's a tragic death... But he really is an hero... This is sooo sad. Rest In Peace Bravo!! That's terrible, how did the tourists get home? Although this tragic event didn't happen at the Devil's Pool and was guided by an unauthorized tour, I find it appalling that generally speaking, the entitled mentality of western tourists and their bloated expectations all too often lead to indigenous peoples suffering the loss. Thrill seekers...stay home, go home, or yield to your stupidity in isolation...let your families eulogize you as brave and going out the way you wished. Let them foot the bill. I wouldn't necessarily make the judgment that ALL Western Tourists travel with a sense of entitlement. 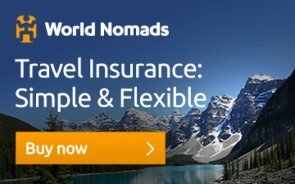 granted it does happen, but I have seen Eastern Tourists run amok in the Canadian Rockies and along the edge of the Cliffs of Mohar in Ireland with complete abandon and disregard for the safety of others, let alone their own! It is hard to see and know that death is either not reported or stories altered so the community can continue to prosper. Just try to not be so daring or look too cool. Enjoyment does not need to be proven in an act that can take ones life. Sending blessings and well wishes to all. This is so sad. He ended his life to save another person. The tour guide will always be remembered.